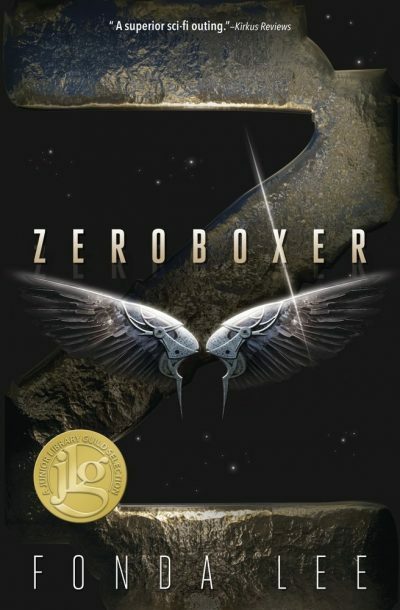 2015’s standalone futuristic sports story Zeroboxer was Fonda Lee’s debut novel. Zero gravity boxing — zeroboxing — provided Carr “the Raptor” Luka with his ticket out of Toronto and up into orbit, where the best people live. It’s a brutal sport — but for the handful who claw their way to the top, it can be lucrative. Despite his youth, Carr is a promising boxer, promising enough that respected impresario Gant offers Carr a contract. With luck and the right handler, Carr could become one of the luminaries of the Zero Gravity Fighting Association. Pity that Carr’s success is based on a lie. Climate-change-wracked Earth has long been resentful of the success of the Martian colonies. One of the manifestations of this resentment is an abiding loathing of genetic engineering as applied to humans, something the Martians were forced to embrace to survive on their hostile world. On Earth, corrective procedures are tolerated, but wholesale, wilful enhancement of humans is both illegal and anathema. Unbeknownst to Carr, he was designed before birth to be an exceptional athlete, although not so exceptional as to be clearly engineered. Mr. R, the man who convinced Carr’s mother to allow this, is in the business of creating exceptional individuals. The few who ride their potential to professional success only discover what they are when Mr. R demands 20% of their earnings for the rest of their lives. His creations cannot turn on Mr. R without turning themselves in. Carr is horrified to discover he is an artifact, but not so horrified that he walks away from zeroboxing. Instead, he pours himself into the sport, ascending to its loftiest heights in a few bouts. Unaware that Carr is enhanced, Terrans embrace him as one of their own, a hero who proves that Terrans are as good as Martians. When a Martian versus Terran tourney, the so-called War of the Worlds, is proposed, Carr is pushed forward as an obvious contender. The longer Carr waits to admit what he is, the worse it will look. Immediate confession means losing everything he has worked for. Carr stalls, hoping for a third option. That option manifests in the form of Gene-Pol Detective Ruart Van. Van knows what Carr is but he has little interest in Carr himself. Van wants Mr. R and Carr is a vital piece of evidence in Van’s case. Van’s interest in Carr makes Carr a loose end as far as the criminal is concerned. Mr. R didn’t get where he is by letting loose ends walk around alive. This seems like an opportune moment to admit I’ve never seen Rocky. I have read older sports fiction, like Jack London’s “A Piece of Steak” and any number of YA hockey books so ancient they featured one-eyed coaches because the books predated Jacques Plante. This novel, and Lee’s other works, bid fair to revive my interest in sports fiction. I read this after starting to read Fonda Lee’s Jade City (coming from Orbit). I had read about 10% of that book before realizing it’s a November release and would not benefit from an August review. But I had read enough to have a yen for more Lee. Her Exo is currently somewhere in Mount Tsundoku, so I grabbed Zeroboxer. Jade City is set in an alternate Earth; Zeroboxer is set in our timeline’s future. Much of it takes place in shiny space habitats of the sort we were promised back in the 1970s. Lee embraces familiar tropes, like an Earth annoyed at losing primary status to its upstart colonies and (inexplicably, pointlessly) crewing deep space vehicles. At the same time Lee incorporates some modern ideas: vast Toronto, now 40 million strong1, is semi-tropical thanks to climate enhancement2, the plasma drives that enable comparatively rapid travel around the Solar System are recognizably Diaz’s VASIMIR drives. Zeroboxing has evolved from the efforts of bored space crew to add some pizzazz to the dogged exercising necessary to maintain bone density in free fall. As for the Mars colony: as reluctant as some may be to admit it, Mars’ ongoing terraforming efforts are never going to turn it into a second Earth. Although the grand conflict that shapes the novel is Mars versus Earth, neither world is actually the monad that rivalry might make them seem. Earth is only Earth when seen from far away; down on the ground, the planet is still the patchwork of nations it is now. Similarly, Martians may all look the same from Earth, but on Mars they make distinctions between people from Isidis Planitia and the Tharsis Bulge. The plot of this novel reminded me of the career of Maurice “Rocket” Richard, a French-Canadian hockey player, cultural icon, and flashpoint for Anglo-French rivalries. Success led many French-Canadians to invest their hopes in the player. Richard’s suspension was seen by French-Canadian fans as an egregious injustice and led to the Richard Riots. Similarly, Carr’s success inspires Terrans to become more vocal and more violent in their expression of dissatisfaction at the balance of power between Mars and Earth. This only raises the stakes for Carr’s dilemma, since he has no idea how the mob will react when they discover their hero has far more in common with the hated Martians than he does with them. Why do I think the hockey parallel is relevant? Because the author, Fonda Lee, is Canadian. From Calgary. Why is she trustworthy re the nitty-gritty of martial arts? She has black belts in karate and kung-fu. She also has a sturdy prose style and a good sense of pacing. The fragment of Jade Island I read suggests Lee has grown as an author since writing this but Zeroboxer is a solid beginning. Zeroboxer is available here (Amazon) and here (Chapters-Indigo). 1: One would hope that a book in which Toronto is a vast megalopolis would eschew the usual anti-city sentiments but alas, this is not that book. At least Lee’s Toronto is plagued with problems caused by climate change and a faltering economy. It’s not that that the people who live in cities are effete and degenerate (in contrast to the sturdy rectitude of folks from the hinterlands). Calgarian Lee shows some unexpected kindness to megalopolis Toronto. About the only Canadians who might hate Toronto more than Calgarians would be Montrealers. 2: I really, really, really hate shovelling snow.